I have acquired the inventory of the now defunct Daewoorifleparts.com. This is likely the only cache of Daewoo parts in the county other than a few 922 R parts by various companies. I am attempting to sell this as one lot to an entity that would like to continue to sell these parts and possibly even manufacture parts in the future. I am not a dealer, just a Daewoo collector who did not want to see this stuff disappear into a dusty basement somewhere. I acquired this lot of parts with the sole purpose of finding a buyer that has the resources to sell them. The domain name could be transferred to the buyer if they wanted it. I do not have the time to sell this stuff individually. Below is a complete listing of the inventory. In parenthesis behind each line item is the estimated retail cost. There are several receivers that would have to go to an FFL. I am not an FFL but the receivers are personally owned. The whole lot of parts is quite heavy probably 100 plus pounds. i can arrange shipping at the buyers expense. Local pickup in the Phoenix AZ Area is possible as is inspection by appointment. Feel free to ask questions. Cost for the entire inventory is $11,000.00 We are open to reasonable offers. Total Value is estimated at over 25K. At this time we are not selling any individual parts. Please do not ask about individual parts. This sale if for the entire inventory at one time for one money. Parts list broken down into parts specific to types, and parts common to all types. 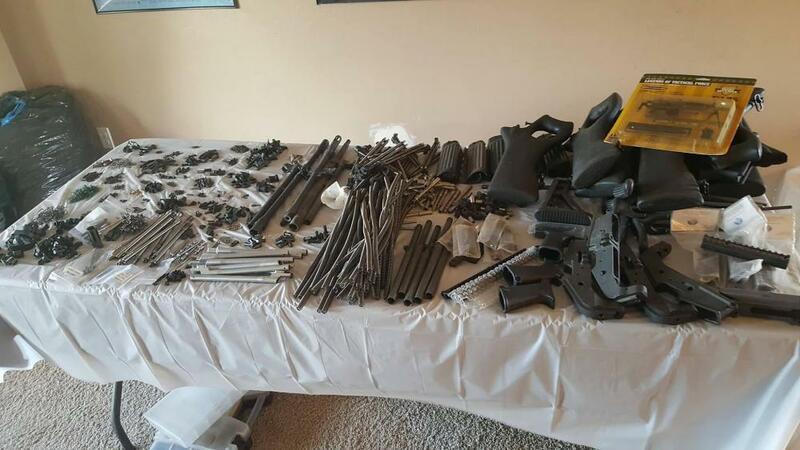 Parts marked with (*) are easily replaced by bulk purchased AR15 parts. Mostly springs. Parts in BOLD are impossible to find or high demand/high dollar value per part items. PARTS FOR PRE-89 guns. Gas piston and DI types. PRE-89 guns gas piston only. Parts for Gas piston guns only. Any progress on selling that inventory? I’m hoping someone has or will acquire it soon and begins selling it as I am desperately trying to get some parts for a DR200. Any info would be greatly appreciated. Of course all 922r compliant versions if available. Ultimately I’d also like a scope rail and may need another internal part or two just for compliance depending on what you have. Thanks again, I appreciate anything you can do. Pistol grips for the DR 200 are difficult to find, there is a person that sells on GB that has them from time to time. Search the other boards. I do not have any for sale. a pre-ban pistol grip will not work on the DR200, you can modify an AR pistol grip to work. The Lage stock you can get directly from Lage, google his website. The charging handle is available from cncwarrior.com if they have any in stock. If you find the rest of the stuff get send me an email and i will see if i have an extra recoil set in my personal stuff. We still are not selling the DRP inventory at this time. Looks like I can get just about everything but the grip (I’ll try the AR grip solution), the charging handle (I’ll keep an eye on cncmachine.com for a new run), the flash hider (which was mainly to fix a stupid thing-and to count as a 922r part), and the recoil spring assembly. The spring assembly will be the real problem I think, I’ve been looking unsuccessfully for a while. Unfortunately my rifle was in pieces when I moved and the box containing my stock, handle, and spring assembly was lost (along with a bunch of mags and around a thousand rounds of ammo). I can make do on everything else but it just won’t run without that spring assembly. I have a really cool, very expensive paper-weight now. Thank you for the information and the time you’ve taken to help me out. Will do, thanks, however I don’t see an email address. i'm the person that has the daewoo grips. i'm currently out of stock at the moment but i can let you know when i get some back in stock. they are each cast by hand so they take some time. That would be great! Put me down for a for sure purchase when you have them. This is encouraging, I was getting a little worried that this awesome gun might never get to see the light of day again. Thanks. Goodmorning, I have been searching everywhere for some parts for my K1A1 and would love to get it up and running. Any chance you have a bolt, gas tube and the spring? I need a charging handle. I would appreciate it. In need of K2 pistol grip, any available? I'm looking for front sight posts/gas blocks for the Max-1 and AR-100. The corrosion was not my doing, I received them like this. All the other stuff is just on the surface. Alternatively, I'm looking for info from a 'woo expert and ways about fixing these. Does anyone have a contact for K2 parts? I bought a K2, it came with a scope mount on it. I removed it but do not have the original screws for the holes on top of the receiver. I need both screws. Any ideas? Do you still have the Daewoo parts inventory, or has it been sold? OP, I am looking for a rear sling swivel/ mount thingymabob for my K1a1 that goes into the receiver (current hole looks like a QD point sans the QD. Do you have suggestions for where I can find this part. I appreciate your post, but it appears after 2 years no one has stepped up to the plate. It would probably benefit you greatly to take 1 photo of each part and put the quantity of those parts with that 1 photo on each listing up on Gunbroker as it would get rid of it all and help everyone desperately looking for one single part. You make money, we get parts. I appreciate a busy schedule as I am myself, this is a suggestion obviously. Also, would I be able to prod you for that said receiver sling swivel thingymabob? Please?